An old friend of Everything Dinosaur is back in stock, the Natural History Museum dinosaur collection set featuring Diplodocus and the armoured dinosaur Kentrosaurus. It is great to see this dinosaur model set that features two Late Jurassic herbivores back on the shelves of the warehouse. The Diplodocus and Kentrosaurus dinosaur models. The Diplodocus model measures around forty centimetres in length whilst the Kentrosaurus, (which was a much smaller dinosaur), measures a fraction under ten centimetres long. Although these dinosaurs lived at the same time, palaeontologists are quietly confident that they never co-existed. Fossils of Diplodocus are associated with Upper Jurassic deposits of the western United States, whilst Kentrosaurus fossils have been found in Tanzania. Diplodocus is one of the most famous of all the long-necked dinosaurs. It is so well known, in part, because a cast of a Diplodocus was donated to the London Natural History Museum by the Scottish-American philanthropist Andrew Carnegie. This 87 foot long replica greeted visitors to the museum as it was located in the centre of the Museum’s Hintze Hall, close to the main entrance. However, in 2015 a decision was made to relocate “Dippy” as the specimen had become affectionately known as and replace it with the skeleton of a Blue Whale (Balaenoptera musculus). 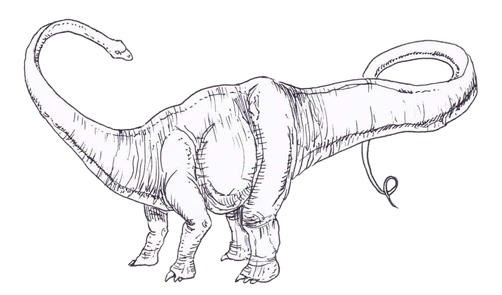 A drawing of Diplodocus “double beam”.